The 2016 NFL season’s first three weeks are in the books, which means it’s time to look at Week 4’s picks against the spread. Early Sunday afternoon, we have a cross-country battle between the Oakland Raiders and Baltimore Ravens. Who has the best odds in this one? Location: M&T Bank Stadium; Baltimore, Md. Sports Information Traders went 11-4 in the first three weeks of the season in the Westgate Las Vegas Supercontest; learn more here! An intriguing early game this Sunday is the Raiders at the Ravens, and there’s a few reasons for this. First of all, both teams have started the year off strong. The Raiders are 2-1 with two road victories, while Baltimore is an unblemished 3-0. So, can the Raiders keep the road wins coming, or will the Ravens hold strong and undefeated? Secondly, more to the point, who the heck are the Ravens this year? Yes, they’re 3-0, but they’re one of the most nondescript 3-0 teams of all time. They beat the Buffalo Bills 13-7 at home, then beat the Cleveland Browns by just five on the road, and followed that up last week with a two-point win on the road over the Jacksonville Jaguars. Baltimore has found ways to win, but nothing has been overly impressive or stood out from any of those wins really. Thirdly, are the Raiders actually a playoff contender? Last year, at least at one point, Oakland looked really good with this young, studly offensive lineup. Derek Carr, Latavius Murray, Amari Cooper — this offense is dangerous. Oakland came into this year with high hopes, as many people saw them as dark-horse playoff contenders, and they haven’t disappointed so far. A win over an apparently tough-to-beat Ravens squad would look good — and a third-straight win on the road would look even better. With that all established, how do these two teams matchup? Oakland’s defense was a sieve in the first two weeks of the season, giving up 34 and 35 points in Weeks 1 and 2, respectively. Granted, it was against the New Orleans Saints and Atlanta Falcons, whose offenses are no joke. More credence was given to that logic when they held the Tennessee Titans to just 10 points in their own building. Of course, Tennessee isn’t a powerhouse by any means, but it’s still impressive holding any offense in the NFL to just 10 points. This defense also forced three takeaways, and held the Titans to just 16 percent on third down conversions. Unfortunately for the Ravens, their offensive production has been closer to that of the Titans, thus far, than the Saints or Falcons. They’ve averaged barely 300 yards per game of total offense, putting up about 3.3 yards per carry and 6.6 yards per pass attempt. Joe Flacco already has five turnovers to just three touchdowns, and there doesn’t seem to be room for much improvement moving forward. 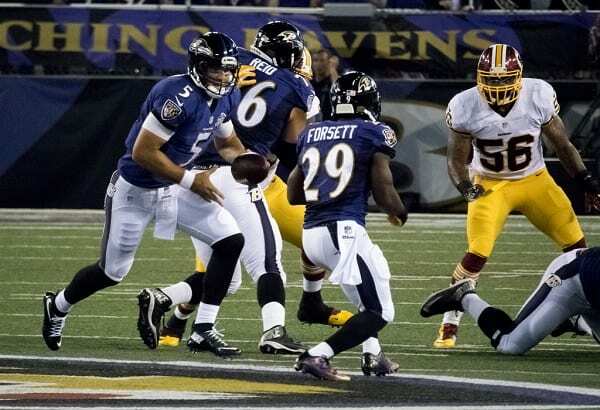 Bets to Make: the Ravens luck is running out, as they’re finally running into a good team. Take the points, as the Raiders will either win big or keep it close. That extra half point adds even more security as the Ravens have been winning games by close margins, which means that even if they win, you will probably still win with that 3.5-point line. Also, take the under. If nothing else, Baltimore’s defense was solid last year and has started this season off in the same fashion.